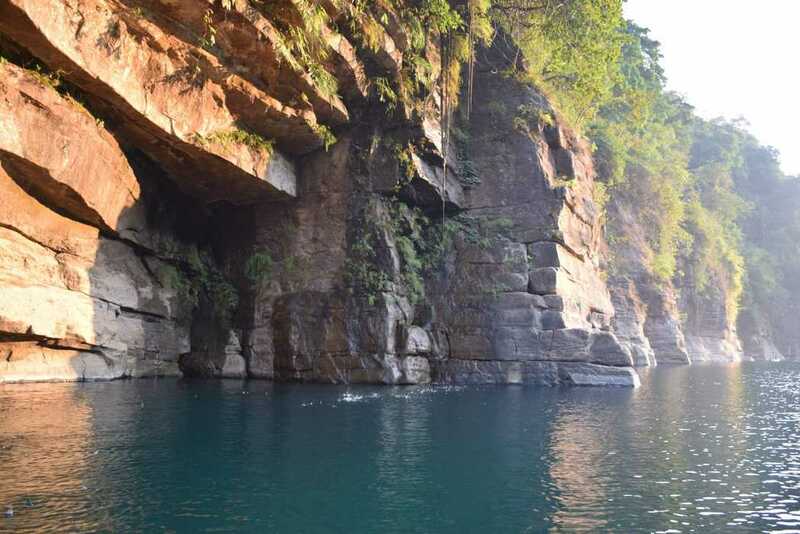 Umngot River at Dawki near Shillong, Meghalaya at Jaintia Hills, is a must visit if in Meghalaya. Sandwiched between India and Bangladesh, Dawki is also known for trade between India and Bangladesh. The small city is famous for its tourism scene, with many people flocking to the city in order to experience a boat ride in its famed Umngot River and enjoy the nearby sights and sounds. As you speak of the Country India,you get filled with some kind of excitement.This curiosity to explore, is something that this country India has preserved since ages. The more you know,the more is left. This Dawki River working as a soft border between India and Bangladesh is one the places where you just see an entirely different level of India. Umngot River, the area you see beyond that boat is Bangladesh. On our Trip to Assam and Meghalaya, after visiting places like Kaziranga national park in Assam. Living Root Bridge in Mawlynnong, Meghalaya we started for the beautify place. To visit Umngot River,Dawki you may need one complete day, we started from Mawlynnong and it took around 3 hours by road to reach this place. The roads reaching Dawky are not very good, therefore be ready for some periodic roller coaster. Although if you have time and if you can drive at the speed of 30km per hours then you won’t have any problem. The passage is filled with very beautiful betel nut Farming Trees. Breathtaking views for the person coming from the north Mountain regions. The difference between the two mountains as per me, Himalayan Mountains are bare i.e less encroached with human cultivation practices. In Meghalaya mountain, you would see mountains are filled with cultivation practices like betel, coconut, pineapple, berries where these plants keep generating steady revenue along with no effect to nature. To my surprise, I did not see any forest fires happening in these mountains. And again comparing the same with Himalayan Mountains in Himachal Pradesh or at Uttarakhand I have been continuously seeing some intended/unintended forest fires and this practice as increased at an alarming rate in the last few years. you get to live amidst nature and people. HomeStays are also more organized and they are now no less than a hotel. But they are situated in locals of the village. you have maximum opportunity to know the local culture more and enjoy more. They are very cheap in comparison to hotels. So if you are looking for a hotel in Shillong India, I would recommend Homestays. The Meghalaya Jungles are Being thickly dense, trees in the Jainti District become one the biggest source of work for villagers. So be ready to smell the betel pre-processing odour while you pass this beautify Hills. Betet Nut Trees on the right Side of the road. What it looked to us was that they management of the Boat booking is with some local Agency or any village body. As the price of the boat ride was not fixed and was not even organized. So do not forget to Negotiate when you take a ride. Ideal cost for 4 person in one boat riding for one Hour would be 1200 Approx. They also have option of short route and medium route as well at cost of 1000 and 800 INR respectively. Things to do at Dawki ? Don’t do anything on the boat, yes you read it correctly. Please enjoy the serenity of the surrounding of Dawky. you will get immense satisfaction because of the surround and the water of Umngot river. Do not put any energy in clicking the picture, as pictures you many get on the internet but the moment that you will miss because of the clicking these picture would never return. Just sit down watch river waters, watch mountains and enjoy. How do We find this Trip to Dawky over all ? A perfect place to spend your evening at, we never loved the boat rider as much as we loved it here. India Being a land of immense diversity makes it happen where you see the culture and language change in every 100 km you walk in any direction. So is the place Dawki, you get to see tremendous difference between people of Assam and Meghalaya. States which are geographically few 100 KM apart only. With one thing in very common between every Indian is that they are always very helpful. The best reason why go for a trip is that it helps you to reinvent your self. Trip gives you a break and reboots your head and makes it fresh. Sitting on the Umngot riverside, makes you realize the actual reason for living. With the note of thanks from Meghalaya we traveled back to Shillong for marked in our Itinerary for next day Trip. To read about our Shillong Day trip please subscribe to our Newsletter, or visit us again. I have more rich learning to share of this place,specially the pineapple story.